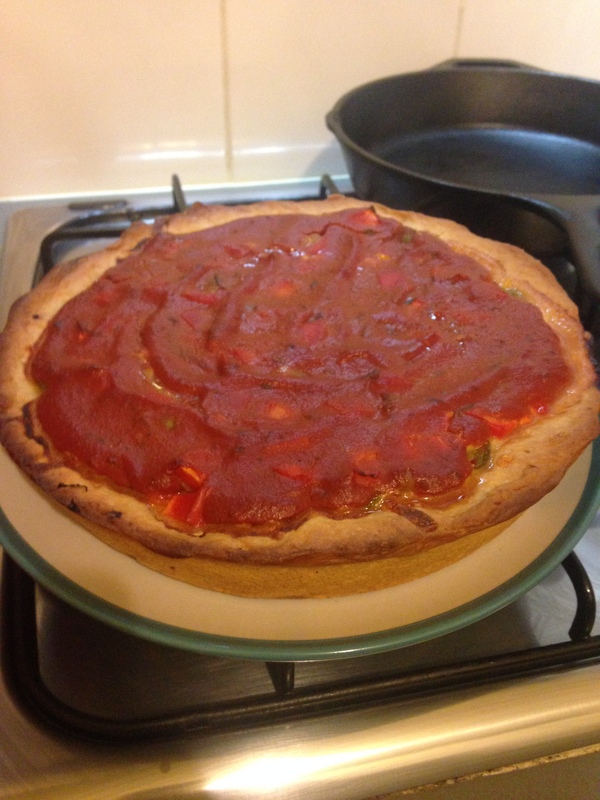 A few weeks back, N tried to make a deep dish, Chicago-style pizza for the first time. It was a delicious flop, literally. The dough didn’t rise but cooked beautifully, so we flopped it out of the pan and ate it upside down. It was still yummy! Anyhow, he gave it another go tonight, this time for our first day of being meat free! We soooo did not miss the meat on this one. This veggie deep dish pizza hit all the right spots with its super cheesy underside and savoury sauce on top. I was pretty thrilled with this one. It could have had a bit more spice/heat, the green chilli we used was pretty mild. Other than that, oh jeeze! This is one we’ll be having again in the future–without meat.